"The question of ordination [of women] is a question which clearly can only be clarified by a council. That cannot be decided upon by a pope alone. That is a question too big [than] that it could be decided from the desk of a pope." Ordinatio sacerdotalis of Pope S John Paul II made clear that the ordination of women to priestly ministries was not something which the Church is able (habet facultatem) to do. He did not discuss whether the Church ought to do it. He made clear that ... like, say, making the Sun revolve around the Moon ... the Church can't do it. However Nice that would be. He made clear also that this is not a matter of Church discipline but of doctrinal principle. The Graf realises that there is only one way of getting round this. It is by resurrecting an error which Benedict XVI spent decades refuting: "After the Second Vatican Council, the impression arose that the pope really could do anything ... especially if he were acting on the mandate of an ecumenical council". In fact, as pope Benedict also pointed out, there is another way in which the matter of women's ordination could be even more definitively resolved: by means of an ex cathedra pronouncement of a Roman Pontiff; it rather sounded as if he was looking forward to such a further clarification. Benedict, of course, foresaw an infallible papal statement on the impossibility of such ordination. It sounds as if the Graf, flashing that familiar sickly smile across his face, envisaged a more positive response from the council which he said must inevitably take place. It is as well to be clear about one thing: according to Vatican I, the infallibility, in limited circumstances, of the Roman Pontiff is just one mode of the exercise of the infallibility of the Church. Any idea that an infallible papal definition could then be reversed or modified by an infallible definition of pope and council combined (or, indeed, vice versa), is contrary to defined dogma. Long time readers will know that I never discuss the ordination of women. That is because pretty well my entire priestly ministry in the Church of England was overshadowed by the question, and it bores me to tears and a good million miles beyond that. But I am going to offer one more piece, not on the subject itself theologically considered, but on practical things to be aware of if, as seems likely, the Catholic Church is determined to waste long decades tearing itself apart just as the Church of England did with regard to this question. Then I shall go quiet upon this matter again for, say, another half a century. It saddens me (although I find it very understandable) to see Cardinal von Schönborn being vilified not only here but all over the "blogosphere". During my time as a university student in Vienna in the early 2000s, I came to enjoy his monthly catecheses in the Stephansdom which, to my rather limited knowledge, were of sound doctrine. One must also not forget that it was he who drafted the Catechism of the Catholic Church which, as I understand, is a cornerstone of the whole Ordinariate endeavour. Did there not used to be an excommunication for the crime of appealing from the pope to an ecumenical council? How could Baron von Graf not know this? Cardinals claiming there can be women Priests, Prelates, and Popes must put their lofty status where their mouth is. He should resign and announce that Ms. so-and-so is his replacement. Perhaps using the logic of Fr. James Martin they can state that Ordinatio sacerdotalis was never "received" by those desiring Women's Ordination which thereby trumps any Doctrinal considerations. As someone who reverted to the Catholic Church after 20 years as an Episcopalian I also have no desire to plow that furrow again. The Pope can do anything that a council can do- under the usual conditions. Certainly, he can- and has- stated that no woman can ever be a priest. Roma locuta est. In cases such as these- Causa finita est! Fr. Hunwicke, you say "In fact, as pope Benedict also pointed out, there is another way in which the matter of women's ordination could be even more definitively resolved: by means of an ex cathedra pronouncement of a Roman Pontiff; it rather sounded as if he was looking forward to such a further clarification." My understanding (and I could easily be wrong here) is that a pope speaks ex cathedra when, "in the exercise of his office as shepherd and teacher of all Christians, in virtue of his supreme apostolic authority, he defines a doctrine concerning faith or morals to be held by the whole Church." Can. 749 §1. By virtue of his office, the Supreme Pontiff possesses infallibility in teaching when as the supreme pastor and teacher of all the Christian faithful, who strengthens his brothers and sisters in the faith, he proclaims by definitive act that a doctrine of faith or morals is to be held." Can. 749 §3. No doctrine is understood as defined infallibly unless this is manifestly evident. I understand that he must be intending to speak infallibly and must frame his words in such a way as to make it clear that his is doing so. "4. 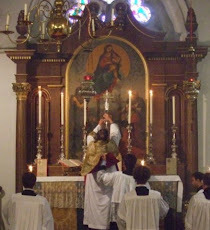 Although the teaching that priestly ordination is to be reserved to men alone has been preserved by the constant and universal Tradition of the Church and firmly taught by the Magisterium in its more recent documents, at the present time in some places it is nonetheless considered still open to debate, or the Church's judgment that women are not to be admitted to ordination is considered to have a merely disciplinary force. This seems to me in every way to be as definitively defined as Pius IX's and Pius XII's statements on the Immaculate Conception and Assumption, respectively. This is a sincere question to which I would truly like to know the answer: Are there other elements that must be present for a papal statement to be considered ex cathedra, and if not, which element was missing in Ordinatio sacerdotalis? What am I missing? Because to this layman, it all sure seems to be there. @Victor -- Please go back and read Ezekiel 18 and Matthew 7:21. Having edited the Catechism does not make the cardinal impeccable. I am not a canonist either. But Cardinal Ratzinger was writing officially as Prefect of the CDF; he explained the different levels of Magisterial statement and gave the Ordination of Women explicitly as an example of when something which has been been part of the Ordinary Universal Magisterium is lifted to the next stage: an infallible statement by a Council or Pope. Which makes a thing irreformable ... and to be held definitively de Fide. I hate to sound sarcastic ... but I am inclined to think that he, writing officially as Prefect of the CDF, in collaboration with S JP2, is more likely to have got these important technicalities right than ... I am. Cardinal R had previously made clear that Ordinatio Sacerdotalis is an authoritative statement of what the Ordinary Universal Magisterium already contains. Again, this is clear enough for me. And the experts say that for something to be ex cathedra, this must be made clear by the Pope when he defines it. Since Cardinal R didn't think OS was ex cathedra, it can't be obvious that it was. Religious patriarchy is an obstacle to grace, and therefore an obstacle to holiness. It is a cultural tragedy that is becoming a doctrinal travesty and a pastoral disgrace. It is wrong to confuse the faithful into thinking that apostolic succession is contingent on masculinity. We need women priests and women bishops.